In the following the most important pre-defined applications will be presented. Fig. 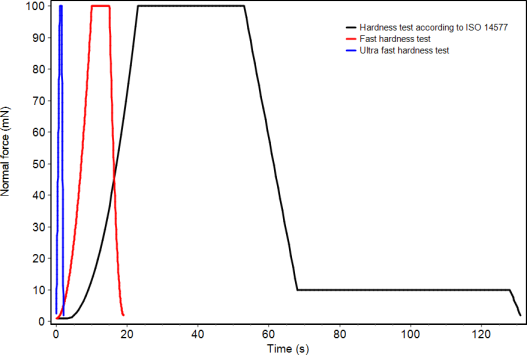 1: Predetermined sequence of different applications for hardness and modulus measurement with different speeds. For the fast measurements no hold period for thermal drift detection is used. Fig. 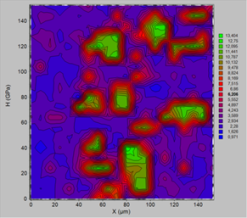 3: Indent array in an Al-Si composite sample (grey particles = Si) (left) and corresponding hardness contour map (right). The test time was 53 min. This application should be used for creeping materials and is following the recommendations in ISO 14577. The creep time is 30 s. A hold period for the determination of the thermal drift is included by default (not applicable to viscous material like polymers). The absolute measurement time is 125 s by default. The sequence is shown in fig. 1. This application has an absolute measurement time of 19 s only with 10 s loading, 5 s creep time and 4 s unloading. A hold period for the determination of the thermal drift is not used by default because the depth error is small when the drift rate is below 0.2 nm/s. Only for shallow indentation depths below 200 nm a hold period should be inserted. The application is recommended for harder materials with low creep. The sequence is shown in fig. 1. The measurement time in this application is only 2s. Additionally the time for surface detection (approach time) has to be considered which is only 3 s - 5 s in comparison to typically 30 s - 40 s in other applications. This application is designated for mapping purposes where between 200 and 10000 indents are necessary. The hardness measured with this application is lightly larger than for standard measurements because the hardness is strain rate sensitive. However the offset can be determined and corrected. Fig. 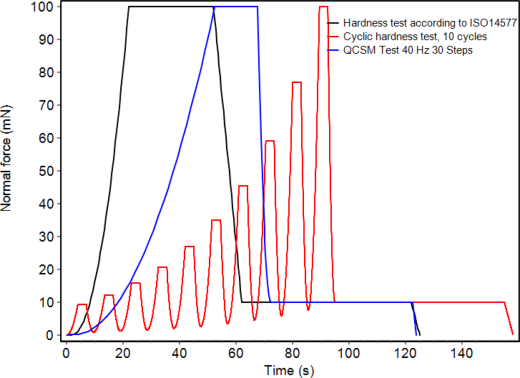 4: Comparison of the sequence of a normal hardness test, a cyclic test with 10 cycles and a QCSM measurement; each with hold period at the end. Fig. 6: Depth dependent modulus results from the cyclic measurements of fig. 5 and a QCSM measurement. The higher point density and the lower error of the QCSM measurement can be recognized. This application allows depth dependent hardness and modulus measurement at one and the same position by successive loading-unloading cycles (fig. 5 and 6). By default 10 cycles are used but up to 100 cycles can be programmed. However, the outcome of this is a large measurement time and the accuracy is reduced due to drift effects. The unloading part could be reduced but then the unloading exponent determination becomes inaccurate. If a dynamic module is available the application 'Hardness + modulus measurement with QCSM method' should be used instead. Fig. 4 compares the sequences of the different test methods. 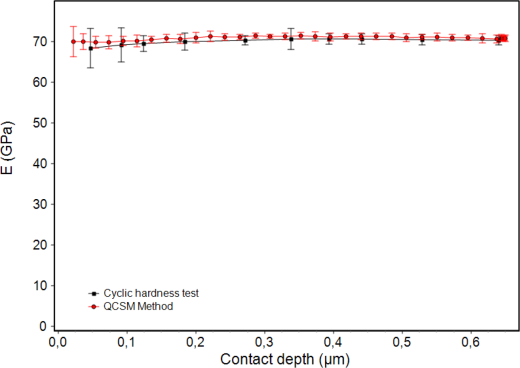 While only 10 results over depth are available from the cyclic measurement in an equivalent time the QCSM method gives 30 results and has a lower error (fig. 6). This application allows programming different fatigue tests with up to 10 million sinusoidal cycles, 100 mN maximum amplitude and frequencies up to 300 Hz. Fig. 7 shows the belonging definition window. Beside the static force and displacement signals also force and displacement amplitude, contact stiffness and phase shift will be recorded. Fig. 8 shows the result of a test with 100000 cycles as example and fig. 9 shows the camera image of the damage with highest magnification in comparison to a static indent with the same force. Application for frequency dependent measurements of contact stiffness, phase shift and E-modulus respectively storage and loss modulus. A scratch test can be done with the LFU over a distance of only 10 µm or less or by using the stage system over a distance of 50 mm or more. Force up to 2 N can be applied with the normal force head and lateral forces up to 2 N can be measured with the LFU. A surface scan (pre-scan) of the surface allows the determination of surface profile and roughness. A scan after the scratch test (post-scan) enables the measurement of the remaining plastic deformation so that plastic and elastic contributions of the deformation under load can be separated. Due to the good displacement resolution and the high lateral stiffness of the shaft, which prevents a bending of the shaft and a rolling motion of the tip, the begin of plastic deformation can be detected very accurately. A remaining plastic deformation of only 1 nm can be detected (fig.10). The detection can be made easier by a subtraction of the surface profile. The yield strength of the material can be determined by a combination with stress calculations (maximum von Mises stress), for instance with the software Elastics. This is also possible for brittle materials like glasses if the tip radius is small enough. The scratch test was developed for the comparison of the adhesion of coatings on substrates. However, this is not possible for all coating-substrate combinations. Further only a relative comparison can be done for measurements with the same indenter on coatings with approximately equal thickness. The measure is the critical force (load) for delamination. According to the standard three critical loads LC1 - LC3 can be measured. The figures 11 and 12 show an example for a DLC coating on silicon. For this coating the point of delamination can be clearly detected. 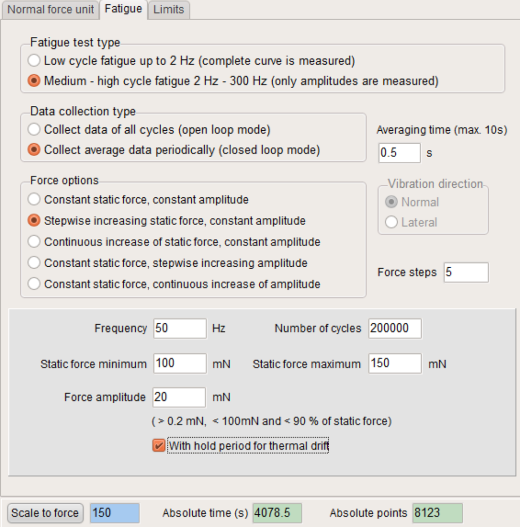 This application is using the LFU to make oscillatory wear tests with up to 2000 cycles. The maximum amplitude is ± 75 µm (length of the wear track 150 µm). 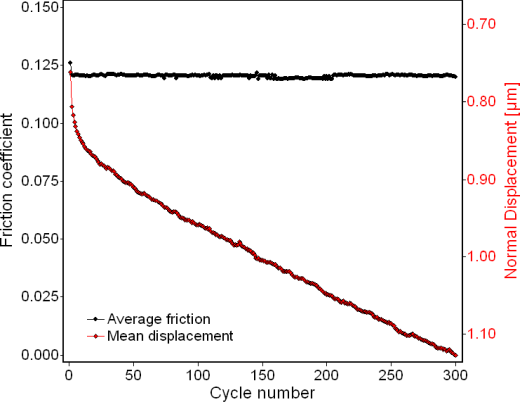 A typical cycle time is 5 s so that long measurement durations may occur. The thermal drift plays therefore a big role for the displacement measurement. It is more accurate to measure the surface profile perpendicular to the wear track after the measurement to determine the wear depth. The friction coefficient however does not depend on the thermal drift and can be accurately measured over long periods. 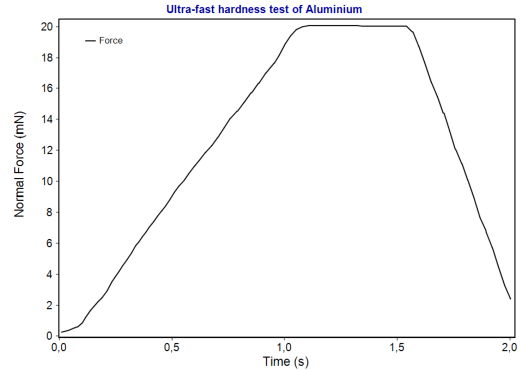 Mean friction coefficient and mean wear depth per cycle are used for the analysis of wear tests and displayed over cycle number or absolute wear distance. Fig. 13 is showing an example for the measurement of a DLC coating on steel with 300 cycles, a normal force of 1 N, a track length of 70 µm and a diamond indenter of about 50 µm radius. 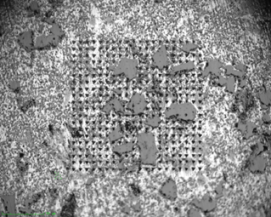 Approximately 1 nm material is removed per cycle. Due to the averaging over the track length a wear rate resolution of better than 0.05 nm per cycle can be realized. Fig. 14 shows the belonging wear tracks of 3 tests with 1 N in the left column and 1.5 N in the right column. Fig. 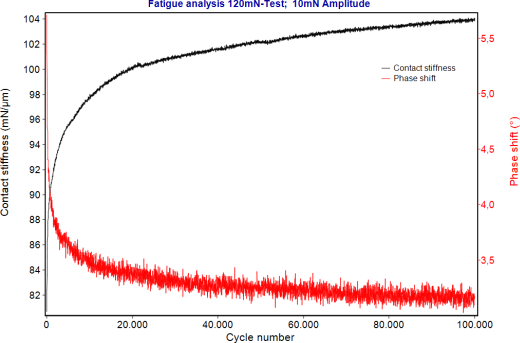 8: Results of a fatigue test with 12 µm radius indenter on a polymer lens with antireflective layer. Fig. 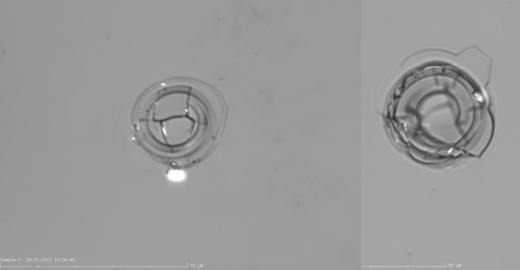 9: Damage of an antireflective layer on a polymer lens after the fatigue test from fig. 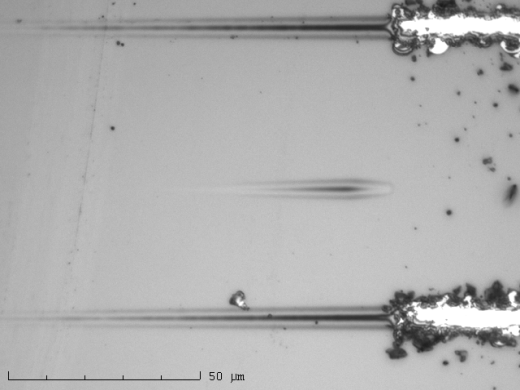 8 with 12 µm radius indenter, a static load of 120 mN, 10 mN force amplitude and 100.000 cycles (right) in comparison to a static test with the same force (left). Fig. 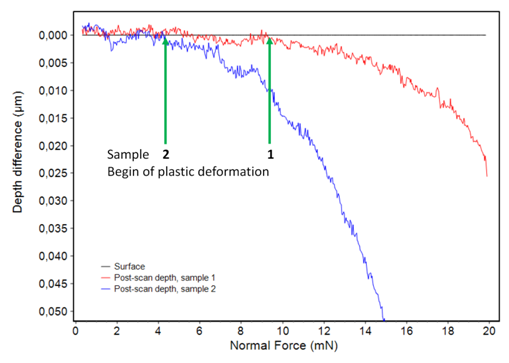 10: Determination of begin of plastic deformation for two different polymer lenses with antireflective layer by a comparison of the surface profile before and after the scratch test. The surface profile was subtracted so that the surface appears as horizontal line. The scratch length was 300 µm and the tip radius 12 µm. Fig. 11: Scratch curves from the measurement of a 500 nm thick DLC coating on silicon. The critical load for delamination is 125.4 mN. This can be recognized by the step in the scratch depth curve, measured under load (red) and the drop of the friction coefficient (blue). The measurement was done with a spherical tip of 5.2 µm radius. Fig. 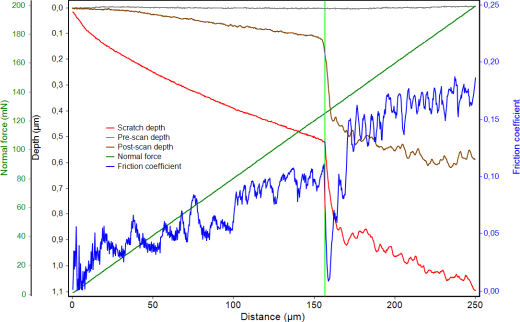 12: Scratch tracks from two tests with 200 mN maximum load in a distance of 80 µm. The force was linearly increasing from left to right. In between there is a small track from a test with smaller load. Fig. 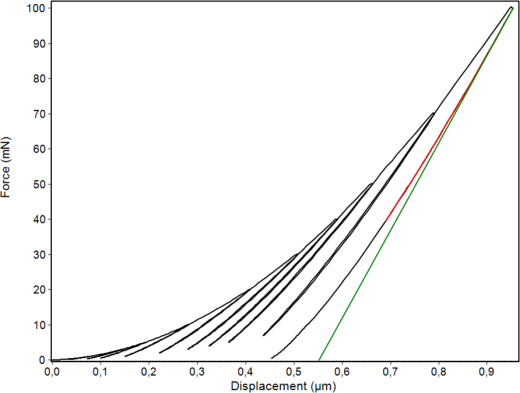 13: Friction coefficient (black) and indentation depth (red) as function of cycle number for a wear test of a DLC coating with a spherical diamond tip of about 50 µm radius. The continuous depth increase with 1 nm per cycle indicates that the wear is not happening by fracture of small pieces of the coating. Fig. 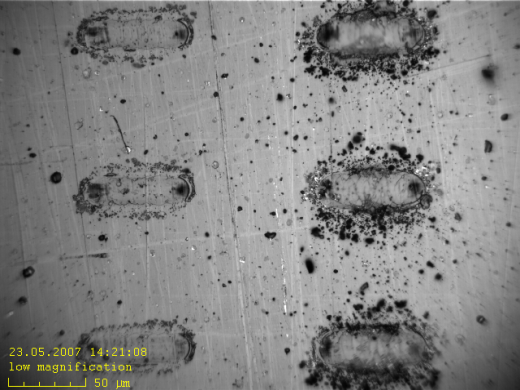 14: Wear tracks from three tests with 1 N (left) and 1.5 N (right) on a DLC coating. The worn carbon material is deposited around the track.